This combo pack is my 2 favourite products! Perfect for use after clipping to restore the depth of colour to the coat and replentish the horses natural coat oil balance. Used daily as a finishing rinse or grooming spray, HSE Hot Oil produces not only a brilliant shine, but makes grooming easier with less dirt filtering down through the hair to the skin. With one single treatment, HSE Hot Oil eliminates dry sunburnt coats and calms flakey itchy skin. Photographers also love this product… so easy to use for quick makeovers, turning hairy unkempt coats/manes/tails into smooth gleaming hair in minutes! HSE Hot Oil concentrate makes up to 20 litres of body spray for everyday grooming. GOT BRASS?? Yellow or discoloured manes or tails? Whites not Bright? Flaxen is just a little too orange? HITONE SILVER – Concentrated Liquid Toner for Whites, Greys & Blonde. 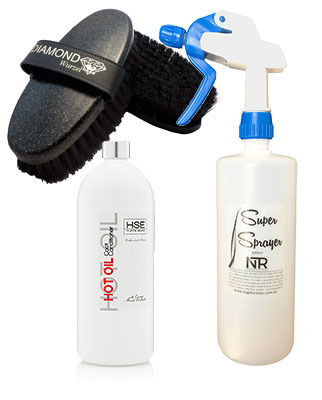 No more scrubbing with harsh detergents to get those white tails silvery white! One capful (5ml) per litre of water will get rid of yellowing alltogether.